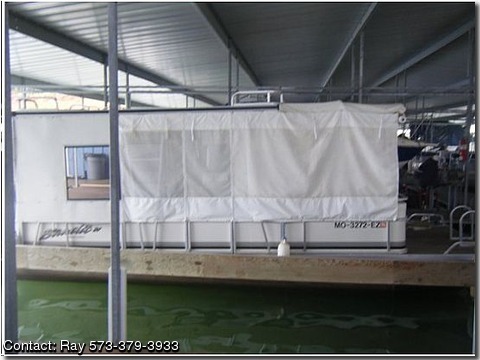 Pontoon Camping Boat for Sale? This pontoon began at the Landau factory in southwest Missouri in 2004. The upper deck was ordered with the pontoon. The metal enclosed portion aft of the side-gates was made with the same metal as the pontoon fencing purchased from Landau after the boat was delivered. The windows were made and installed by Jackson Glass of Caruthersville, Missouri. Those windows are one way mirror glass. We can see out but others cannot see in. The original enclosure was destroyed in the ice storm of 2008 when southeast Missouri was declared a national disaster area. The new enclosure was made by Penrod’s upholstery of Patterson Missouri. I was invited to try and rub a hole in a swatch of the fabric with a flat screwdriver. After 10 minutes without progress I gave up and decided it was the right fabric for the job. Mr. Penrod also recommended one way screens with privacy flaps for the sides. You can see the shadow of someone on the boat but cannot tell if the person is male or female or what they look like. The enclosure is admired by others at the marina, not only the fabric but the craftsmanship. The swim platform is up front. The access ladder is actually made for a dock. It puts 4 of the 5 steps down into water. This boat is the easiest pontoon to climb aboard from the water of any that we know about. The ladder will hold 750 pounds. I used ½ inch diameter stainless bolts with lock nuts to anchor the ladder to the deck. Under the deck 1 x 4 treated lumber was used to add strength. Holes drilled through the deck went through the lumber and bolts went through both. At Clearwater lake 90 feet of anchor line comes in handy. The Danforth anchor was chosen because it holds and does not get stuck on bottom debris. The boat is powered with a 60 horse 4 stroke Suzuki engine. This motor has ran trouble free since purchased. The only work done on it has been winterization. I cannot help but recommend the Suzuki 4 stroke. The pontoon furniture was upgraded at the time of original purchase. All of the seats fold out to make beds. The forward seats fold out and a queen size air mattress fits perfectly onto the seats for a very comfortable bed. We keep the air mattress and sleeping bags under the seats in storage compartments. The boat has 2 tables. One table is mounted aft within reach of the captain’s chair and rear seats. The other table is actually a folding table. It is much like a large TV tray in design but it is longer and made of plastic resin. That table conveniently folds up for storage. When the whole family shows up for boating, we have table room for all to eat. Did I mention the Weber gas A West Marine water heater with shower for summer use is mounted next to the gate. The unit is electric and it warms the water 20 degrees. The flow is continuous and there is not tank. Included is a popup enclosure curtain. The sink has a manual pump faucet with a 5 gallon water tank. That was ordered with the boat. Next to the sink is a 2 cubic foot electric refrigerator. It can be run on shore power or the West Marine inverter connected to the dual batteries. Finally there is a small electric cooker on the refrigerator. It includes a coffee maker, single burner and toaster oven. I installed the shore power hookups. The wiring is 12 gauge outdoor, enclosed within plastic conduit. The conduit is exposed behind one of the ceiling joists of the upper deck and behind the metal framing port and starboard. The arrangement allows 2 outlets. These are exterior boxes with covered sockets and moisture barriers. The inverter was connected using 8 gauge wire and battery connectors. Running the refrigerator out on the lake keeps food and drinks cold. The refrigerator is one of the most often used items on our boat. It takes up little room but stores enough drinks for a day on the water. It does deny complete access to the port entry gate but the trade off is worth the price. The stereo system has 4 deluxe speakers and a CD player. The pontoons under this boat are U shaped and foam filled. We appreciate the floatation and they cut the water well. The extra weight of windows, 2 batteries and the 29 gallon gas tank put a lot of weight in the rear. We solved that problem by adding a 3rd pontoon. It improves the performance and reduces gasoline consumption. Most of what I have added to this boat could have been purchased originally but the cost would have been much greater.